When I was 10 or 11 years old, my mom took me out to lunch, just the two of us, at a crunchy food court place downtown. We went often; I got beef teriyaki with green onions over rice and she got vegetable tempura or something with tofu from the Japanese place. Then we’d find a table and eat our meal. That day, as we waited for our food, I saw another mother out with her grown son. He was probably about 20 and he had no hair. His eyes looked sad, maybe tired, and they stared off into the middle distance. I didn’t know why he had no hair, or why his mom, who was smaller than him, held his arm and helped him walk. But I wanted to know, I sensed that there was a story there and so I watched them as they ate their lunch near us. I didn’t say anything to my own mother about it until we had left the building and were waiting to cross the street. I remember exactly where we were when I did – in front of the Woolworth’s that for a while became a Long’s and which is now long gone. My mom became noticeably tense from my words. Her face got very serious and she grasped my hand tightly. Then she looked at me and said, “Be careful. You need to keep your energy separate from others’. Don’t take in their pain, their feelings. That energy can hurt you.” There was a very real fear in her words and in the way she spoke them. I don’t remember responding. This is one of those moments from my childhood that I remember with such clarity that it could have been just last week that I was the age my own daughter is now. I don’t remember having a longer conversation with my mom about this, but I do remember thinking deeply about what she’d said, not just that day but for years to come. As her own story as a mother unfolded, her words began to make sense in a way I hadn’t truly understood them before. I’ve often thought that the story of my mother’s departure from our family just a few years later would make a great work of true-to-life fiction, but I have hesitated to write it. I remember a conversation with my husband when he was just beginning his studies to become a rabbi. We talked about how the Torah doesn’t command us to love our parents, but it does instruct us to honor and respect them. Even in the years when contact with my mother was elusive, I always had a desire to respect her need for privacy, to respect the parts of her story that were solely her own to tell (or not to tell). I still do. But her story is also my own story. Her choices, her actions, her needs and her mistakes – they have formed me. In ways I’m not sure she really knows, my mother has shaped me – during her years of presence and her years of absence. While I am no longer the daughter whose mother left her who became such a central part of my identity during my teens and twenties – the years when I was either burying my anger and sorrow in Ben & Jerry’s or working through them in therapy – I am still and forever my mother’s daughter. So, in the words of Anne Lamott, perhaps if my mother had wanted me to write warmly about her (or not write about her at all), she should have behaved better (and not encouraged my writing since I was a child). This is probably a good time in my life to look at that story because all these years later my anger has mostly dissolved. I don’t know if warmly is the word I would use, but there is love there. Forgiveness even. A loosening of the entanglement that binds me to my mother. I understand now that the words my mother spoke to me that day in front of Woolworth’s were a reflection of her own fears. Even then, several years before her need for independence pulled her from our lives, I think she may have been consciously separating herself from the heaviness she felt in the world around her. The thing is, I didn’t understand then how what she was telling me to do was even possible. Not feel the sadness around me? Not feel compassion for those in pain? Not feel incredible joy when those around me felt joy? How do you do that – not feel empathy – and why would I want to? My mother, I also understand now, is a lot like me – highly sensitive to everything around her. But we are different, too: What I feel, what I take in because I am sensitive, doesn’t scare me. I feel like it is why I am here in this life this time around. If I’m not here to connect deeply to those around me, to everything around me, then what’s the point? Is there anything more important than connection? Is there anything more juicy, more fun, more thrilling, more real? We are permeable, emotional and connected beings, even the most reclusive, the most aloof, the most removed among us. We can’t help it and sometimes we fight like hell against it because it can be scary to connect, terrifying to truly feel each other. We might hurt each other and we might be hurt. We might also be cracked open in the most magnificent ways. During the years just before my mother left when I was 15, she was already beginning to withdraw, to hide out. After she left, there were many years when I allowed myself to disappear into the loss of her. Who was I without her guidance, without this woman who had so often been my best friend? Was I still her daughter? Was she still my mother? Food quickly became a comfort and I ate a lot after she left; and while I got bigger as a result, in many ways I felt smaller, more invisible inside my new larger skin. (That’s another post, though, about the ways in which we see each other differently – or don’t notice each other at all – because of size, color, age.) I hid in that new body for several years, hid from the loss of my mother, from the pain she had unleashed in me, from my anger towards her. I was absent without her presence, and so I became the daughter whose mother left her. This became my new identity. Maybe, though, it’s less about mastery than about compassion and gentleness – mostly towards ourselves as the nurturers, and also towards our children when our very last button – you know, the REALLY BIG RED one that reads, DO NOT PUSH THIS BUTTON OR ELSE! – is about to be pushed. We’re never going to be perfect, I’m not sure there is such a thing as the perfect mother. I am deeply entangled with my children – in good ways, in ways that stretch me, in ways that trigger me (my daughter still has to get through middle school), in ways that create space for our relationship. There are days when it’s easy to feel like I am disappearing, as if without my children I’m not entirely sure who’s left. A few weeks ago at dinner, asserting my motherly right to sit at my usual place at the table next to my toddler son on a night when my daughter wanted to sit there instead, I heard myself saying, “I exist too! I have needs too!” My husband and children held the befuddled looks on their faces for about one tenth of a second before bursting into laughter, and about two tenths of a second later I joined them. I am at my best as a mother – as a human – when I can remember not to take myself too seriously. While it has loosened over the years, my mother and I are still deeply entangled. It’s been more than two decades that my voice has sounded like hers. My cheeks are hers, especially when I smile. I have her big eyes that smile along with my mouth. 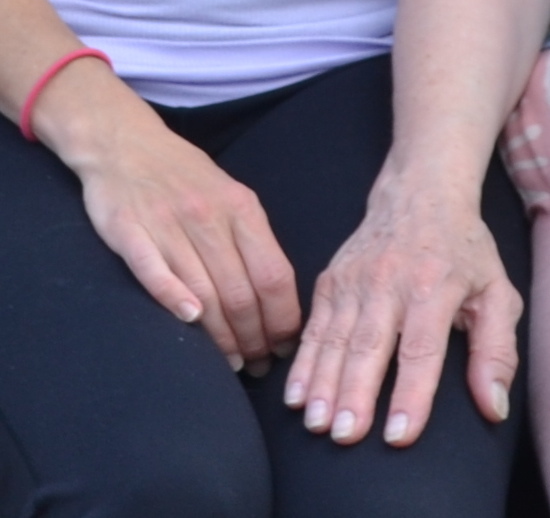 My hands look like her hands, especially as they age. We have had the same laugh for a very long time. I am a good mother like she was during those early years, and since some of the pain of her abandonment has dissolved, I can let myself connect with those times. I am sometimes prone to worrying like I remember her worrying, like I am sure she still does. But I am conscious that her fears are not my own, and I know how to assuage my own fears when they show up. I am no longer the daughter whose mother left her, but her leaving is forever a part of my story. And what I became afterwards… well, that is the real story. Gal-you have a deep reservoir of strength and forgiveness to be able to write about your mother with such equanimity. I stopped trying to forgive my own mother and father a long time ago. That they did the best they could never gave me much comfort. I think those of us who were abandoned by our parents have a particular flavor of emptiness we carry. It makes us hyper-vigilant and self-protective at worst and compassionate and generous parents at best.